A large variety of stitches for all types or sewing, such as fashion sewing, quilting, heirloom, crafts, home and decorative sewing. 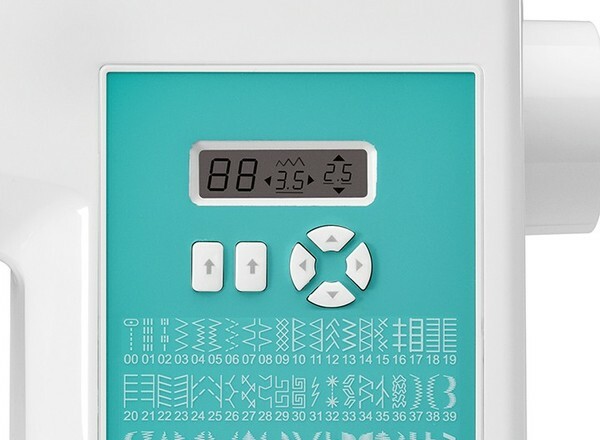 Select the desired stitch with just a simple push of a button. Optimum settings for length, width and tension are set automatically. Choose from 6 different one step buttonhole styles. Buttonhole sewing is a one-step simple process. Each side of the buttonhole is sewn in the same direction, creating beautifully balanced buttonholes. After effortlessly threading the machine, this feature automatically threads the eye of the needle! Select whether the needle is up or down when the machine stops. It is beneficial to have the needle stop in the down position when appliquéing, quilting or pivoting fabric. When removing the fabric from the machine, it is easier if the needle is set to stop in its highest position. The lamp illuminates the sewing surface for optimal viewing. The long-lasting bulb (100,000 hours) stays cool, regardless how long the machine is operated. 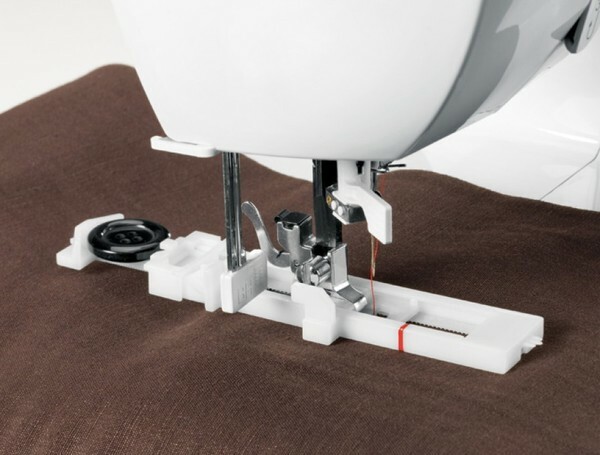 For your added convenience and comfort, the machine can sew without use of the foot controller. 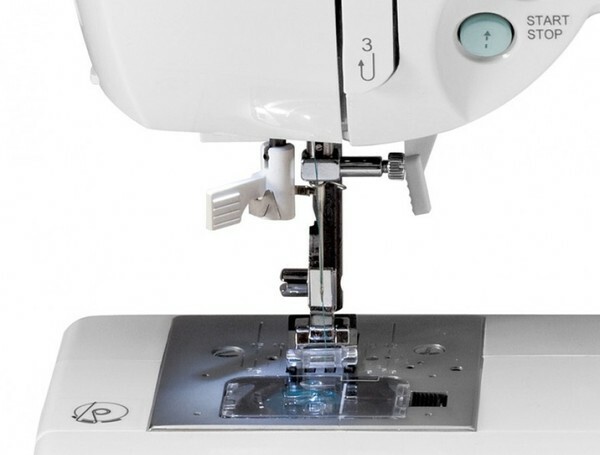 Have complete control over the speed the machine when sewing without the foot controller. This helps improve handling on more intricate projects. This system ensures excellent stitch quality, whatever type of fabric is being used. 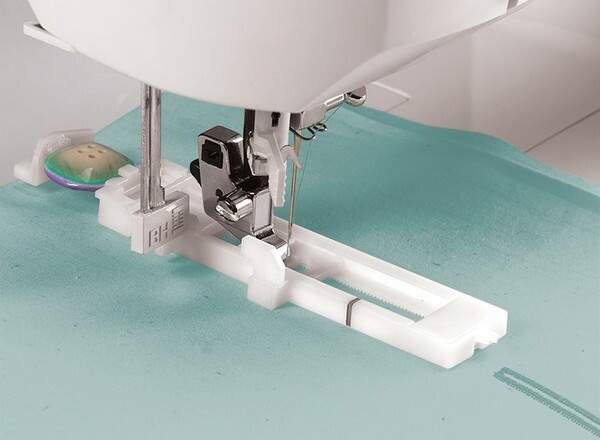 This mechanism incorporates a magnet-type vertical axis rotating hook that ensures smooth, quiet, thread jam-resistant sewing. The bobbin case floats above the hook, precluding thread jams. The bobbin loads from the top, so it is easy to insert the bobbin. 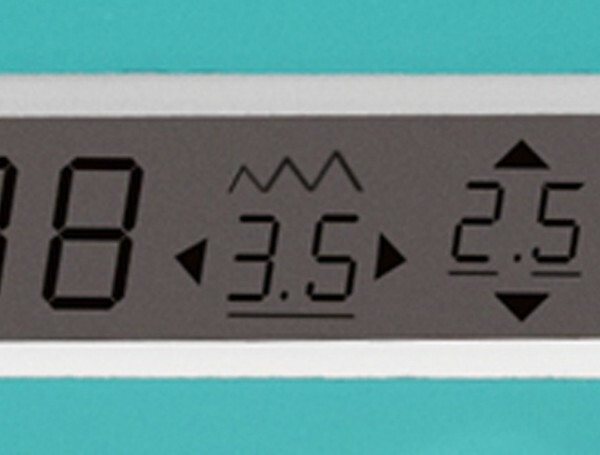 The clear cover makes it easy to monitor the bobbin thread supply. Tie-off straight stitches with just a push of a button. Reinforcing the beginning and end of the seam prevents unraveling. Tie-off decorative stitches, at the beginning and end of a stitch sequence, with just a push of a button. 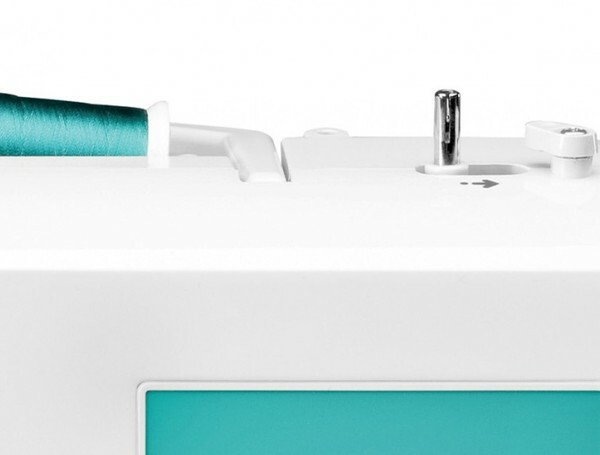 Push the conveniently located Automatic Reverse Button to sew stitches in reverse. Most stitches can be set for a maximum width of 6mm. When sewing decorative stitches or satin stitches, the wide stitches are bolder and more pronounced. Thread a machine in 6 seconds! Just follow the arrows on the machine...and you are threaded in a snap. An audible tone confirms pattern and function selection. With a maximum sewing speed of 750 stitches-per-minute, projects can be sewn quickly. The amount of pressure exerted on the fabric by the presser foot against the feed dogs is automatic. Sew from the lightest weight tricots to the heaviest denim, without making presser foot adjustments. Needle bar automatically disengages when winding the bobbin, making bobbin winding safer because the needle won’t move up and down. Bobbin will automatically stop turning when the bobbin is completely filled. Never worry about overfilling a bobbin again. Specially designed stitches that add strength and flexibility to seams. These are especially useful when sewing on knitwear and super-stretch fabrics. Optimal settings for length and width are automatically adjusted when choosing a stitch. They can be overridden to personalize length and width choice. When tapering with the zigzag stitch, the stitch tapers to the center, not the left or right. This provides a more attractive look when tapering into or out of a point. When using a twin needle (optional), selected stitches can be adjusted for twin needle sewing by reducing the stitch width. Twin needle stitching creates two parallel rows adding a decorative touch. Needle position can be changed for individual projects, such as inserting zippers or cording and topstitching. This is a SINGER® name for a control system that senses when additional power is required to maintain speed through thick or changing fabric conditions. This feature is most useful when sewing through multiple (6-8) fabric layers. electronic and 1 year labor. Click here for full warranty details. There are 2 heights to the presser foot lifter. The second height offers more clearance, which is needed when placing multiple layers of bulky fabric under the presser foot. This is a specially designed feed dog that ensures that the fabric is picked up and supported from the front of the presser foot to the rear. This makes for much more accurate feeding. The internal skeleton of the sewing machine. 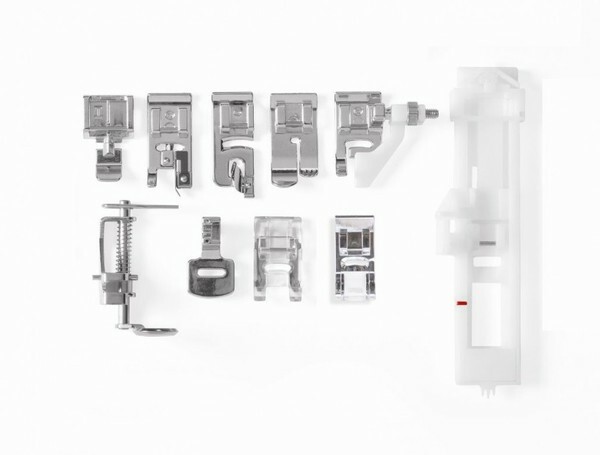 This rigid support holds all the mechanisms in perfect alignment for perfect, skip-free sewing. US Warranty 25 Years mechanical, 2 years electrical, 90 days labor on defects in materials and workmanship. Introduction to the Singer Stylist 7258. 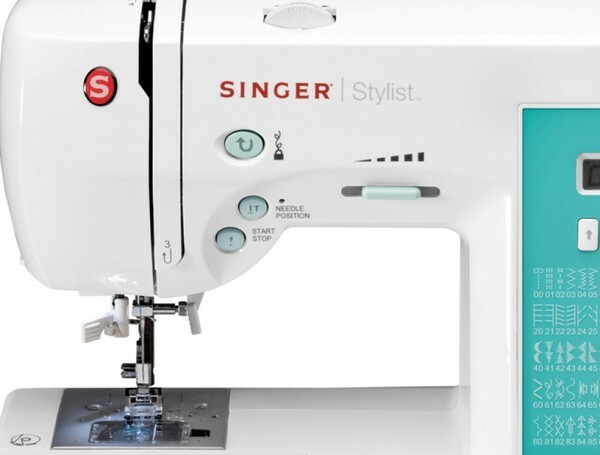 Kiana Taylor shows how to get started with the Singer Stylist 7258, from winding a bobbin to threading the sewing needle. 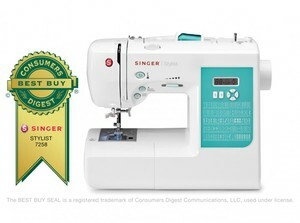 Watch the video and when you're done, you too will be ready to jump into your first sewing project with the Singer Stylist sewing machine.